Millions of people suffer from painful and swollen joints associated with arthritis. In the past, many doctors told arthritis patients that dietary changes would not help them. However, this conclusion was based on older research with diets that included dairy products, oil, poultry, or meat. [1,2] New research shows that foods may be a more frequent contributor to arthritis than is commonly recognized. It is clear that, at least for some people, a healthier menu is the answer. Arthritis is actually a group of different diseases. Osteoarthritis is a gradual loss of cartilage and overgrowth of bone in the joints, especially the knees, hips, spine, and fingertips. Over 20 million Americans, mostly over age 45, suffer from osteoarthritis, which seems to be the result of accumulated wear and tear. Although it can cause painful episodes, it is characterized by only transient stiffness and does not cause major interference with the use of the hands. Rheumatoid arthritis, which affects over 2 million people, is a more aggressive form of the disease. It causes painful, inflamed joints, which sometimes become damaged. Rheumatoid arthritis is one of medicine's mysteries. There were no medical reports of the disease until the early 1800s. Some have suspected that a virus or bacterium may play a role, perhaps by setting off an autoimmune reaction. Genetics may also be a factor, in that it may influence susceptibility to the disease. For years people have suspected that foods are an important factor in the development of rheumatoid arthritis. Many notice an improvement in their condition when they avoid dairy products, citrus fruits, tomatoes, eggplant and certain other foods. Initially, the evidence was anecdotal. A woman from the Midwest once suffered from painful arthritis. Today she is a picture of health, thin and athletic, and her arthritis is totally gone. It seemed that dairy products were to blame for her arthritis, for when she eliminated them from her diet, the arthritis disappeared completely. Another woman, from Wisconsin, also found that her arthritis was clearly linked to dairy products. Although she had been raised on a dairy farm, she learned that staying away from dairy products was the key to relieving her symptoms. A 1989 survey of over one thousand arthritis patients revealed that the foods most commonly believed to worsen the condition were red meat, sugar, fats, salt, caffeine, and nightshade plants (e.g., tomatoes, eggplant). Once the offending food is eliminated completely, improvement usually comes within a few weeks. Dairy foods are one of the principle offenders, and the problem is the dairy protein, rather than the fat, so skim products are as much a problem as whole milk. An increasing volume of research shows that certain dietary changes do in fact help. For example, polyunsaturated oils and omega-3 supplements have a mild beneficial effect, and researchers have found that vegan diets are beneficial. One 2002 study looked at the influence of a very low-fat vegan diet on subjects with moderate-to-severe RA. After only four weeks on the diet, almost all measures of RA symptoms decreased significantly. The journal Rheumatology published a study that found a gluten-free vegan diet improved the signs and symptoms of RA. An uncooked vegan diet, rich in antioxidants and fiber was shown in another study to decrease joint stiffness and pain in patients with RA. Some research studies have looked at fasting followed by a vegetarian or vegan diet. A review of multiple research studies concluded that this dietary treatment might be useful in the treatment of RA. Vegan diets dramatically reduce the overall amount of fat in the diet, and alter the composition of fats. This in turn can affect the immune processes that influence arthritis. The omega-3 fatty acids in vegetables may be a key factor, along with the near absence of saturated fat. The fact that patients also lose weight on a vegan diet contributes to the improvement. 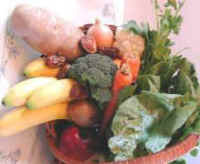 In addition, vegetables are rich in antioxidants, which can neutralize free radicals. Oxygen free radicals attack many parts of the body and contribute to heart disease and cancer, and intensify the aging processes generally, including of the joints. Iron acts as a catalyst, encouraging the production of these dangerous molecules. Vitamins C and E, which are plentiful in a diet made of vegetables and grains, help neutralize free radicals. Meats supply an overload of iron, no vitamin C, and very little vitamin E, whereas vegetables contain more controlled amounts of iron, and generous quantities of antioxidant vitamins. As well as being helpful in preventing arthritis, antioxidants may also have a role in reducing its symptoms. Some arthritis treatments, including non-steroidal anti-inflammatory drugs, work at least in part by neutralizing free radicals. For the most part, however, vitamins and other antioxidants will be of more use in preventing damage before it occurs, rather than in treating an inflamed joint. A diet drawn from fruits, vegetables, grains, and beans therefore appears to be helpful in preventing and, in come cases, ameliorating arthritis. For four weeks, include generous amounts of foods from the pain-safe list in your routine. At the same time, scrupulously avoid the major triggers. It is important to avoid these foods completely, as even a small amount can cause symptoms. Foods that are not on either list can be consumed, so long as you are emphasizing the arthritis-safe foods and scrupulously avoiding the major triggers. You may well experience benefits earlier than four weeks, but for some people it can take this long for chronically inflamed joints to cool down. Water: plain water or carbonated forms, such as Perrier, are fine. Other beverages – even herbal teas – can be triggers. Condiments: modest amounts of salt, maple syrup, and vanilla extract are usually well-tolerated. After four weeks, if your symptoms have improved or disappeared, the next step is to nail down which one or more of the trigger foods has been causing your problem. Simply reintroduce the foods you have eliminated back into your diet one at a time, every two days. Have a generous amount of each newly reintroduced food, and see whether your joints flare up again. If so, eliminate the food that seems to have caused the problem, and let your joints cool down again. Then continue to reintroduce the other foods. Wait at least two weeks before trying a problem food a second time. Many people have more than one food trigger. It is not recommended to bring meats, dairy products, or eggs back into your diet. Not only are they major triggers, but they also encourage hormone imbalances that may contribute to joint pain, and also lead to many other health problems. TThese supplements are available in health food stores. 1. Panush RS, Carter RL, Katz P, Kowsari B, Longley S, Finnie S. Diet therapy for rheumatoid arthritis. Arthritis and Rheumatism 1983;26:462-71. 2. Lithell H, Bruce A, Gustafsson IB, et al. A fasting and vegetarian diet treatment trial on chronic inflammatory disorders. Acta Derm Venereol 1983;63:397-403. 3. Sobel D. Arthritis: What Works. New York, St. Martin's Press, 1989. 4. Skoldstam L, Larsson L, Lindstrom FD. Effects of fasting and lactovegetarian diet on rheumatoid arthritis. Scand J Rheumatol 1979;8:249-55. 5. Skoldstam L. Fasting and vegan diet in rheumatoid arthritis. Scand J Rheumatol 1986;15:219-23. 6. McDougall J, Bruce B, Spiller G, Westerdahl J, McDougall M. Effects of a very low-fat, vegan diet in subjects with rheumatoid arthritis. J Altern Complement Med. 2002 Feb;8(1):71-5. 7. Hafstrom I, Ringertz B, Spangberg A, von Zweigbergk L, Brannemark S, Nylander I, Ronnelid J, Laasonen L, Klareskog L. A vegan diet free of gluten improves the signs and symptoms of rheumatoid arthritis: the effects on arthritis correlate with a reduction in antibodies to food antigens. Rheumatology (Oxford). 2001 Oct;40(10):1175-9. 8. Hanninen, Kaartinen K, Rauma AL, Nenonen M, Torronen R, Hakkinen AS, Adlercreutz H, Laakso J. Antioxidants in vegan diet and rheumatic disorders. Toxicology. 2000 Nov 30;155(1-3):45-53. 9. Muller H, de Toledo FW, Resch KL. Fasting followed by vegetarian diet in patients with rheumatoid arthritis: a systematic review. Scand J Rheumatol. 2001;30(1):1-10. 10. Merry P, Grootveld M, Lunec J, Blake DR. Oxidative damage to lipids within the inflamed human joint provides evidence of radical-mediated hypoxic-reperfusion injury. Am J Clin Nutr 1991;53:362S-9S.